Welcome to High Tech Middle! We want to welcome you to the 2018/2019 school year! We plan to make it a great one with lots of fun and successful events! 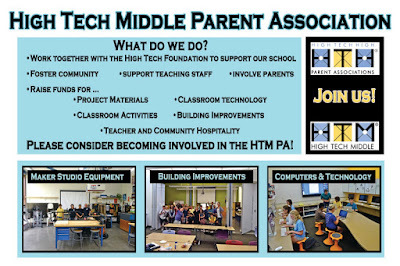 The High Tech Middle Parent Association (HTM PA) works together with the High Tech Foundation to support our school by fostering community, supporting the teaching staff, and involving parents. The PA sponsors social events to bring the school together, and fundraising opportunities to help supplement the school budget. Money raised through donations and fundraisers goes directly into classrooms to purchase equipment, project materials, and classroom supplies. Whether you can spare a few hours, or take on a larger role, we need volunteers! Help out with a fundraiser or donate supplies, participate in PA meetings, share your ideas of how to improve our school. Parent support and involvement truly makes a difference to our students! We look forward to meeting you at our monthly PA meetings, the first Thursday of each month at 9:00 am. If you are new to the High Tech Village, download this list of helpful Acronyms. Shop AMAZON for Christmas HERE! - http://htm-parentpage.blogspot.com/ -. Simple theme. Powered by Blogger.